Ophrys kotschyi and its two subspecies Ophrys kotschyi subsp. cretica and Ophrys kotschyi subsp. ariadne are found throughout southeastern Greece and a number of the islands in the south Aegean Sea. They look remarkably similar and are separated into subspecies because they are pollinated by different insects. Ophrys kotschyi grows to around 40cm, and has a lax inflorescence which carries between 2 - 10 large vivid flowers. The sepals are green with brownish markings. The lip is dark brown or purplish-black and velveting in appearance. The shiny purplish speculum consists of a broadly H-shaped but often highly complex pattern bordered with white. This orchid is endemic to Cyprus. 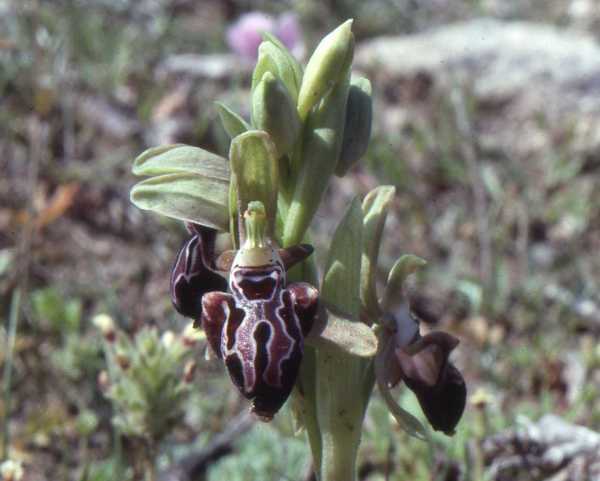 Ophrys kotschyi grows in dry-to-moist calcareous substrates in open sunny positions. Poor grassland, pesticide free old olive groves and roadside verges are all candidates when searching for this orchid. The specimen shown on this page was photographed in Cyprus.